I shouldn’t have been surprised at the brilliance of Twofold Inc. ($3.99) from Swedish developer Grapefrukt Games. After all, these are the folks who made Rymdkapsel ($3.99), which is not only one of the finest strategy games on any platform but a phenomenal lesson on minimalistic design. And yet, as I worked my way through Twofold’s fantastic tutorial and eventually got plopped into the regular game mode, fully equipped to take on the many facets of the game, I found myself taken aback at just how ingenious all the various parts of the game fit together. If you listen to our podcast this week, you might laugh at me trying to explain Twofold Inc. out loud. It’s tough! Like I said, there are a lot of facets to this game, but the tutorial is excellent and even though it might sound complicated it’s actually not bad at all. So if explaining Twofold in spoken words was tough, it’ll be near impossible to do so in written words. But… here goes! 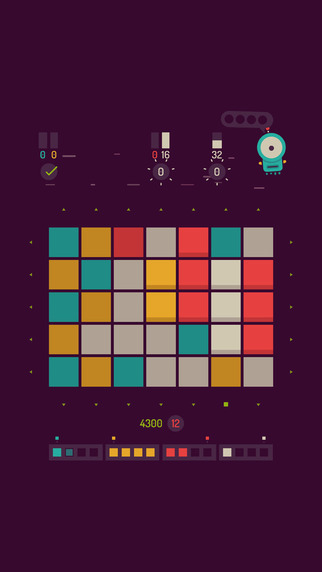 The game is built around a 5×7 grid of colored squares. You can match two or more colored squares that are besides each other, but you can’t match diagonally, only horizontally and vertically. You also have to use all of the matching squares in a grouping, so if you have a string of 5 of the same color squares, you can’t only match 3 of the 5, for example. You have to match them all in one go. You make matches by drawing a line similar to how you make words in Spelltower ($2.99), though again you can’t drag diagonally to make matches. Matching is only one tiny part of the picture, however. Each square you match nets you points, starting with 2 for the first square and doubling with each square added to the total match. So for example, matching 3 squares would give you 8 points in the end: 2 for the first square, 4 for the second, and 8 for the third. Lengthy matches can lead to some insanely large numbers, but again, the actual scores you earn for matches are really just a tiny part of the overall game. So you have the ability to make matches and earn points for those matches, next up is the “requests." Twofold will throw various batches of colored progress bars at you with a number below each one. For example, a yellow bar with an 8 under it means you need to match enough yellow blocks on the board to make at least 8. Since the requests come in batches, you may have a first batch with say a yellow, red, and blue bar, and then a second batch with yellow, white and blue bars. You need to make a match of at least the number under the bar, but you can make more than the requested number too, and if you do so those additional points will spill over into the second batch’s bar of the same color. So if the first batch’s yellow bar is a 4, and the second batch’s yellow bar is a 16, and you make a yellow 8 match on the board, you’ll clear the first batch’s yellow bar of 4 and that additional 4 will go towards the second batch’s yellow bar, taking it down from 16 to 12 thanks to the extra 4. Phew! You following along so far? The final piece of this entire puzzle is the move allotments. Each request batch has a green number below it signifying the number of moves you’re given to clear all the requests in that batch. What counts as a move? Making matches does, but you can also shift each column or row of the grid up or down and left or right, and each time you do that it counts as a move as well. If you run out of an allotment of moves for a batch, each move afterwards will subtract from your character’s life, and if you deplete that it’s game over. You can earn additional moves by making large matches on the board and you can earn back life for your character by clearing each level of requests. Okay! That pretty much explains everything (I think). I told you it sounds complicated, but I promise it’s not. In fact, the complexity of the game is the thing that makes it stand out so much. There are so many options for you to explore and much like Chess it’s the kind of game where you really need to try and think several moves ahead and plan for your future. If you start just making every match you see on the board you’ll get yourself in a bind real quick. And this is the thing about Twofold Inc. that I just can’t get over. It looks like such a simple block-matching game, but in reality it’s one of the cleverest and deeply strategic puzzlers I’ve ever played. I’ve seen some people say “this is the next Threes! ($5.99)" and I really have to agree. I haven’t had a game grab me and then continuously surprise me the more I played it since Threes! I have a feeling this will be a game that I continue to learn new things about for months and perhaps years to come. 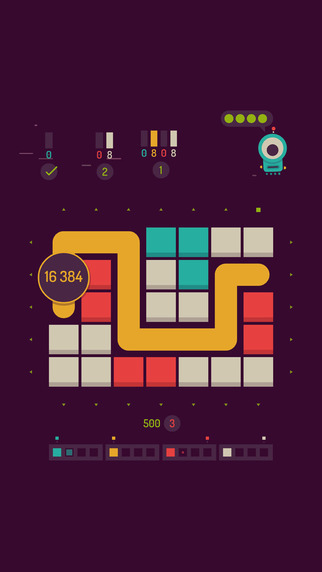 This was a fantastic week for new puzzle games, and Twofold Inc. leads the pack in our mind and it’s our pick for Game of the Week.